The Test Building is an innovative mixed use building designed to include one of the earliest parking garages in Indianapolis, ground floor commercial spaces, and offices. The building is noteworthy not only as an early mixed used building, but also for its refined Neo-Classical Revival architecture. Nine stories with a smooth dressed Indiana limestone façade, the Test Building occupies a prominent site on Monument Circle. When the heirs of Charles Edward Test, former president of National Motor Vehicle Company, decided to construct a building with a 6-story parking garage and ground floor commercial spaces on such a prominent site, the public protested, but when another three stories and offices were added to the design the city issued the permit for construction. The Test family hired Bass, Knowlton & Company to draft plans for the building in 1923. Though its internal structure is a reinforced concrete frame, the architects called for a conservative, well-detailed Neo-Classical Revival exterior. A series of scroll-edged relief panels mark the third story. Each depicts different landmarks, for example, a domed governmental building similar to the Indiana Statehouse, or different modes of transportation. Biplanes, trucks, a dirigible, and a boat are included. Local artisan Alexander Sangernebo sculpted the panels. In addition to the nostalgic stone panels, the Test Building also illustrates the early automobile age in Indianapolis in other ways. Along the north wall, visitors will find two overhead garage doors. The Tests planned for a significant portion of the building to serve as an auto garage. Their architects designed the building with the innovative “d’Humy” ramp system and parking between the lower commercial spaces and the offices above. It is believed, but not proven, that the Test Building was the first purpose-built structure of its kind in Indy when opened in 1925. The building could accommodate 200 automobiles and contained two-thirds of all parking spaces in the heart of downtown 20 years after it was built. 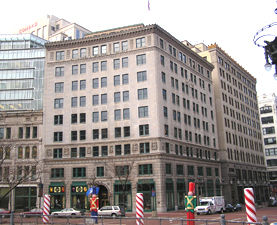 The Test Building is located downtown at 54 Monument Circle. Businesses allow public access for their patrons.